Gallery of cosmetic make-up for imitation of emotional images. It is possible to deceive man's impressions by means of false emotions, or otherwise to tell by means of lying facial features which are imitation of desirable physiognomic symbols in this online gallery, but it is impossible to deceive emotional impressions by means of false images of cosmetic make-up. The open mouth and joyful eyes seem dismal as eyebrows express sad emotions. Sad eyebrows and joyful eyes seem candid as the mouth expresses open emotions. 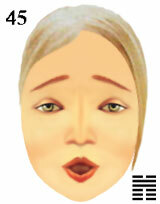 The open mouth and sad eyebrows can seem glad as eyes express joyful emotions. Sad ideas deform pleasure of eyes and break admiration of feelings. Eyesight of the person is not glad to world around as mind is sad, but feelings are frank and consequently eyes wish to see the world. imitation of emotional image by means of cosmetic make-up.